14daysofZespriSA Archives - Wots For Lunch? It’s been a week, a few people entered by little Zespri giveaway and now the time has come to announce the winner. Congratulations Jackie, I’ll be in touch soon to organize getting your prize to you. So it’s the last day of the 14 days of Zespri challenge and as a reward for sticking with me during all the kiwifruit madness I have a little giveaway for you. Not only did the awesome people at Zespri supply me with a few a two week supply of kiwis and and pack of kiwifruit accessories, they also gave me an additional pack of items to give away to you. a Fruit & Veg City voucher to the value of R150 to buy your own two week supply of kiwifruit. To enter, use the Rafflecopter widget below to leave me a comment letting me know which of my 14 Days of Zespri posts was your favourite. For extra entries share a photo of you doing something funny with a kiwifruit or tweet about the giveaway. You’ll have a week to enter and I will close entries next Sunday, 29 September 2013 this Friday, 27 September 2013 and announce the winner the following Monday. Also, don’t forget about the Zespri Cut, Scoop and Enjoy competition. You could win a R1,000 Yuppiechef voucher by sending your Cut, Scoop and Enjoy photos to zespri@storybookcommunications.co.za. 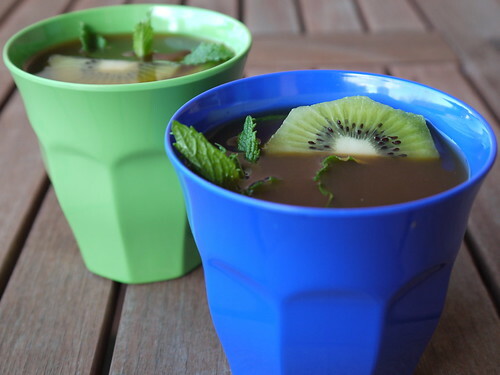 We’re nearing the end of the Zespri kiwifruit 14 day blogger challenge, today’s challenge is to think up a refreshing kiwifruit drink. Although it’s still pretty cold in Cape Town, it’s the beginning of Spring and the warmer weather is just around the corner. While we’re still wrapped in warm blankets or huddled around fireplaces most Capetonians are dreaming of Summer days filled with braais and picnics. 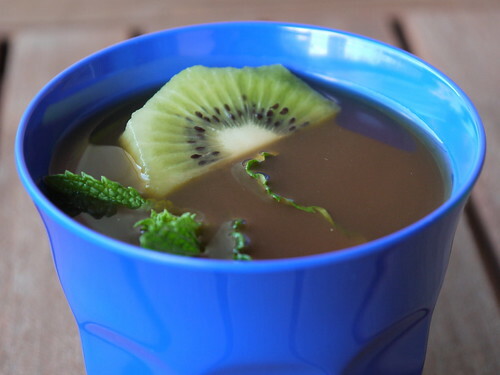 This kiwifruit and mint rooibos iced tea fits pretty neatly into those daydreams. Poured into a small thermos I think this would make a lovely addition to a packed lunch. Or you could spike each glass with a shot of vodka or spiced rum before pouring in the tea for an iced tea cocktail, yum! Place the rooibos and mint into a tall jug (I used a coffee plunger due to the loose rooibos) and pour over the boiled water. Leave to steep for at least 15 minutes, the long you leave it the stronger the flavours will become. Strain the tea into another just or a bottle. Add the honey and kiwifruit puree, stir to dissolve the honey. Stick in the fridge to cool until you are ready to server. 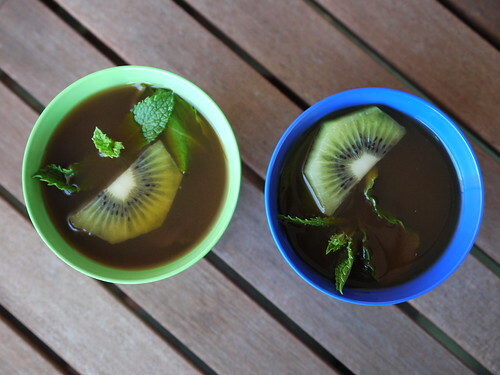 Serve over ice with additional sprigs of mint and slices of kiwifruit if desired. 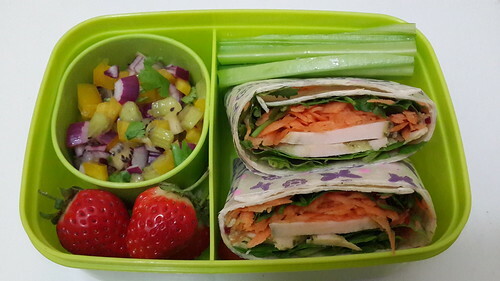 This is going to be my last packed lunch for the 14 days of Zerspri challenge. 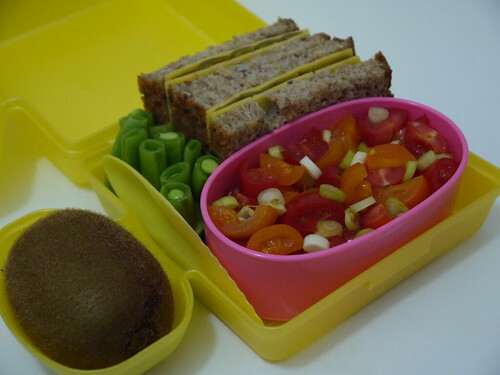 I’ve really enjoyed eating my kiwifruit lunches and I’ve loved being able to add some new items to my lunchbox collection. I opted to keep things simple with this lunch so I’ve got a sandwich, a little salad, some crunch veggies and a kiwi hanging out in it personal side cart. 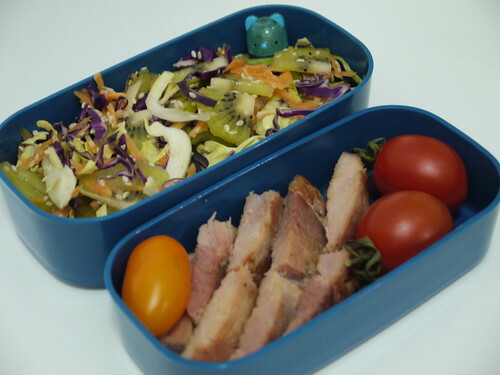 Zerspri are currently running a campaign called Occupy Lunchbox through which they’d like encourage parents and children (and anyone else who packs lunches) to make healthy choices when packing lunchboxes. The ambassador for the campaign is a cutie called KID Z, check her out in the video below to hear all about what she stands for as the face of the Occupy Lunchbox movement. Over the last week and a half I’ve enjoyed eating kiwifruit in all sorts of ways, but my favourite has to be eating it raw, scoop by tasty scoop. Eating it fresh and raw means I can enjoy a low calorie snack high in vitamins B and C with lots of fibre and that helpful actinidin enzyme. Plus it’s low GI too, sounds like the perfect thing to snack on to me. 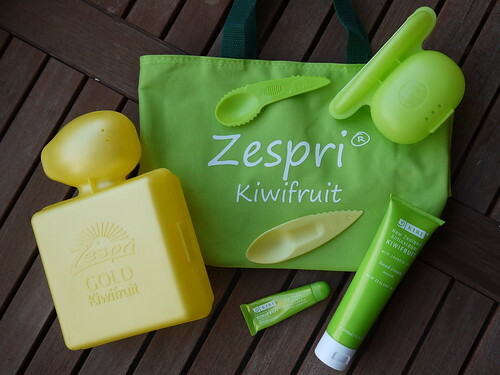 Up until receiving my Zespri blogger pack for this challenge I’d never actually eaten kiwifruit with a spoon. *le shock* I’d always just laboriously peeled it, cut it into chunks and then eaten it. Eating it with a spife is just so much less messy and more convenient. 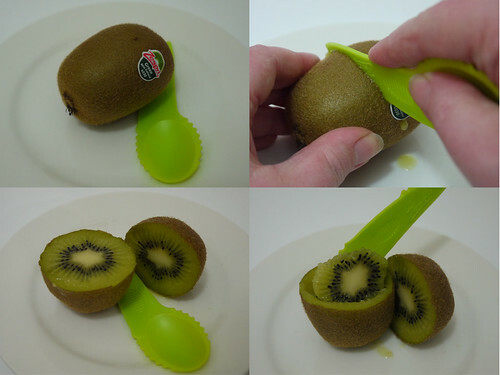 I thought I’d share with you visually how I use the Cut, Scoop and Enjoy method along with my cute spife when I feel like a quick kiwi snack. Zespri are currently running a competition until the end of October 2013 where you could win one of four R1,000 Yuppiechef vouchers. All you have to do is snap a photo of yourself, a family member or a friend enjoying a nutritious kiwifruit using the Cut, Scoop and Enjoy method. Once you’ve got your photo you can then enter the competition by emailing it to zespri@storybookcommunications.co.za. Submissions will be uploaded to the Zespri website and the winning submissions will be announced in the first week of November 2013. 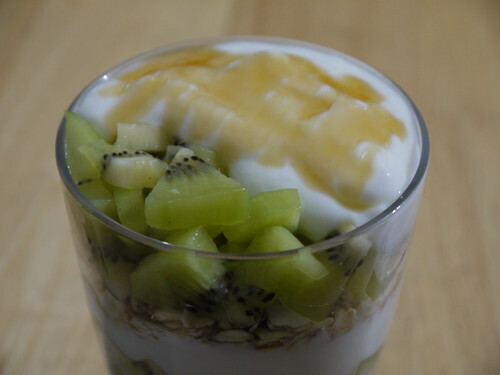 I’ve really enjoyed taking part in the Zespri Daily Scoop of Amazing challenge. I’ve learned you can do more with these fuzzy brown fruits then just peeling them, cutting them into chunks and eating them. I’ve been trying to use them in interesting ways, so far I’ve made a kiwi smoothie, face mask, salsa, kiwi squares and pancakes. 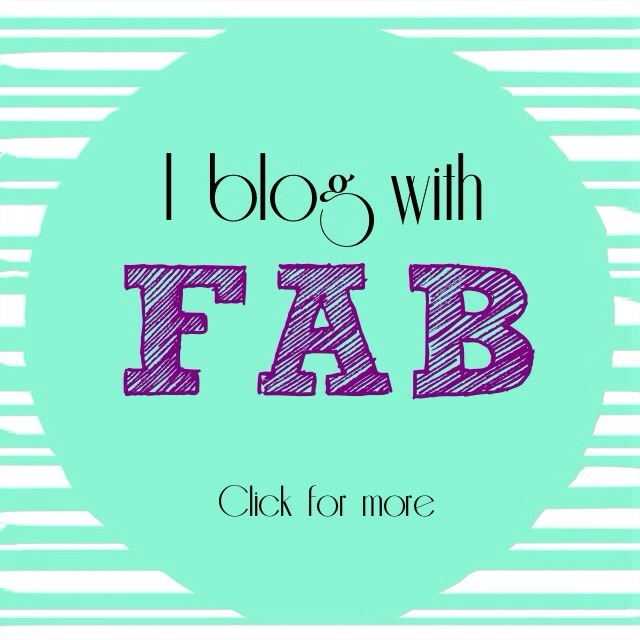 As the challenge has progressed I feel like I’ve gotten my blogging mojo back, something I’m very happy to have returned. My lunchbox today is filled with “leftovers” from a braai we had last night. (Is it still considered leftovers if you purposefully prepared an extra portion of food to stick in your lunchbox?) My boyfriend was so happy to braai that he couldn’t wait to share our interesting supper with his friends over on G+. The ostrich cubes on these kebabs were marinated in a mixture of kiwifruit, soy sauce, garlic, ginger, chilli and olive oil. The kiwifruit in the marinade has a tenderising effect on the meat so it’s best not to let it sit for too long, an hour is perfect. I then skewered them with alternating chunks of kiwifruit and onion. The grilled fruit has a really intensified flavour and the onion turns all sweet and sticky, a yummy option for your next braai or just grilled in the oven. braaied ostrich and kiwifruit kebabs. Here is my recipe for the kiwifruit and ostrich kebabs. Combine kiwifruit, soy sauce, olive oil, garlic, ginger and chili. Add the cubed ostrich steak and mix so that all the meat is covered in the marinade. Set aside to marinate for about an hour. 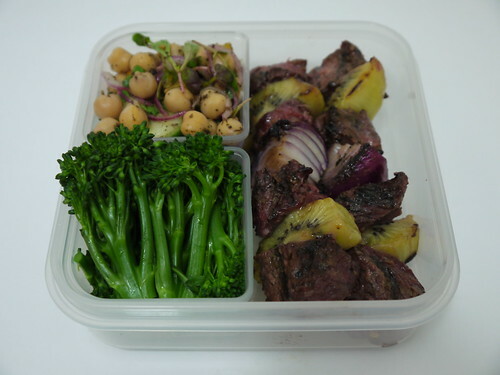 Skewer the cubed ostrich steak interspersing with alternating pieces of kiwifruit and onion. Grill kebabs for 5 minutes on each side. It’s day eight of the Zezpri kiwifruit challenge and today we’re being challenged to share our breakfast with you. I’ve never been able to stomach porridge, since I was a child I’ve always chosen muesli or granola over Pronutro or oats. My preferred way to eat it is with some plain yoghurt and honey. If there is any fresh fruit available that would be chopped up and added to the mix. These days I seem to skip breakfast more often than not and a cup of coffee at the office usually lands up being the first thing that passes my lips in the morning. Taking a little time to prepare a quick breakfast makes such a big difference to the rest of my day. 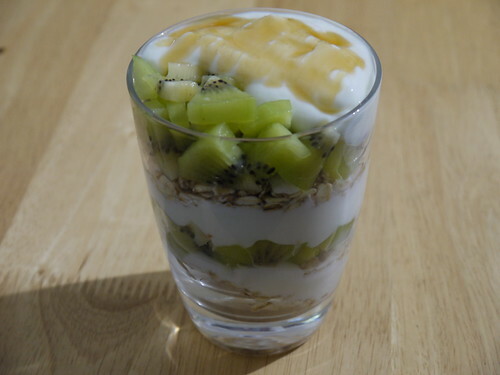 Layering the kiwifruit, granola and yoghurt in a glass and calling it a parfait just makes it a little more special and really doesn’t take much more time than dumping it all into a bowl. I really need to make an effort and sacrifice ten minutes of warm bed time to make sure I’m starting my day off right. I missed two days of posting for the Zespri Daily Scoop of Amazing challenge. 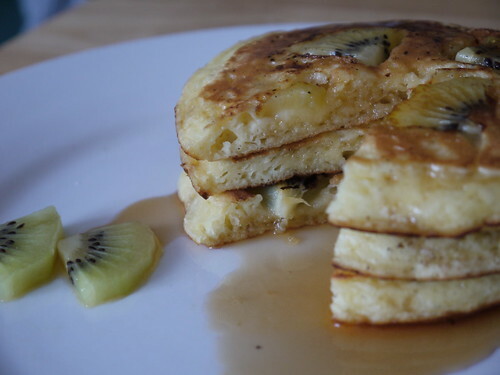 But I’m back with a special treat in the form of a stack of kiwifruit pancakes. Yesterday was a full day of cookieswapping and evening at the Madame Zingara Theatre of Dreams, my first visit and an amazing night out. So today I just wanted to stay in and take it easy. These American style pancakes are a great thing to make for a breakfast at home. I took it so easy that we actually ate them for lunch. A perfectly acceptable Sunday lunch don’t you think? I made the pancakes using this recipe on Instructables. I halved the recipe as I was only cooking for two people and added pieces of kiwifruit before flipping them. 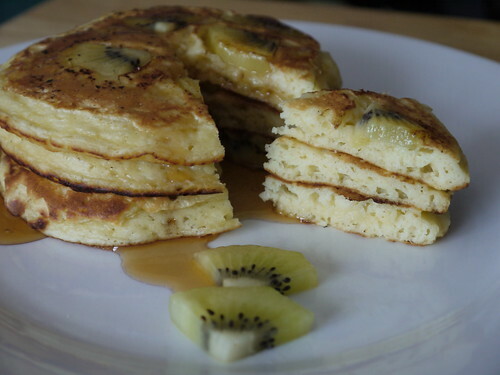 I served them with maple flavoured syrup and the leftover bits of kiwifruit that didn’t make it into the pancakes. You could of course serve them with honey, real maple syrup or just plain if you prefer. Today’s lunch is another kiwifruit laced affair, I’m having fun finding different ways to enjoy my stash of kiwis. I’m supposed to be sharing a recipe with you today, but honestly the salsa in my lunchbox today is so simple it’s hardly a recipe at all. I combined equal parts of diced kiwifruit, red onion and yellow pepper, a handful of chopped coriander and squeezed over the juice of half a lemon. That’s it! The kiwifruit adds a lovely sweet tang to the salsa that is a great accompaniment to the smoked chicken in the wraps. I loosely rolled the tortillas around the chicken and salad so that I had enough room to spoon in the salsa when I was ready to eat it. That way the tortillas don’t get all soggy and are easier to eat. This coming Saturday I’ll be participating in my third annual cookie swap. It’s the third year running in Cape Town and this year there are going to be events in Joburg and Durban too. Seeing as we’re well into our Zespri challenge I thought I’d attempt a cookie with kiwifruit in it and share the recipe with you. Most of the recipes I came across required dried kiwifruit and I don’t own a dehydrator or a very reliable oven so that wasn’t going to happen. I did come across this interesting recipe in an old edition of Lawrence Journal-World from 1987. How retro! The recipe is a variation of a tray bake that you cut into bars once cooled and I think pretty ideal for when you need to bake for a crowd.